Nicaraguan President Daniel Ortega (L) and businessman Wang Jing (R), President of the Hong Kong Nicaragua Canal Development Investment Co, framing an agreement in Managua in June 2013 to build an Interoceanic Grand Canal straight across the Central American country. While Nicaragua was once a central concern—indeed, almost an obsession—of Washington, as Sandinistas and Contras seemed to be battling for the soul of the Western Hemisphere, in more recent times our small and quite impoverished country has slipped off the screens of those who fancy themselves the managers of the “world order.” But recently, a new and quite unexpected global political power play has been threatening to bring our now forgotten country back into world prominence. An unlikely private Chinese entrepreneur has appeared on the Central American horizon promising to bring the largest civil engineering project in history to Nicaragua. This mysterious developer, Wang Jing, has signed a 50-year renewable deal with our government to construct a new canal from the Pacific to the Atlantic Ocean right across our country. At a minimum cost of $50 billion and capable of handling the world’s largest and most modern ships, this Chinese project right in the heart of the Americas will bring myriad uncertainties to Nicaragua. The unfolding of the Nicaraguan Canal is worth paying attention to, because it threatens to significantly reformat power alignments in Latin America and the world. Earlier this summer, the Superior Council of Private Enterprise, known as COSEP, a federation of business groups, organized a public meeting with Hong Kong Nicaraguan Development (HKND), the Chinese company headed by Wang, which was granted a contract for the interoceanic canal without any bidding process over a year ago. The meeting was supposed to provide business organizations and chambers of commerce in Nicaragua with specific information about the current status of this megaproject and the feasibility and environmental studies related to it. Unfortunately, the presentations by HKND and Environmental Resource Management (ERM) were steeped in generalities and even when spokespeople agreed to answer a few questions, vagueness and evasion rather than clarity seemed to be the order of the day. For example, in my capacity as anchor of the television program Esta Semana (This Week), I asked the HKND representative to name even a few of the potential international investors in the canal and explain why, despite the fact that in October last year Wang had said he would present the investors to the public in December, no information of the sort had yet been released. The answers he did provide bordered on the bizarre. He said it was not possible to disclose the financial contributions or the identity or origin of the investors because of the “confidential” nature of “trade secrets” and the nature of the private entities that are listed on the Stock Exchange! All of the secrecy around the financing for this $50 billion project contradicts the promise of transparency initially made by the authorities when the project was first proposed. It is now impossible to know whether it is an international project, or one that will only be funded by Chinese capital, especially state-owned Chinese enterprises and banks that do the bidding of Beijing. The difference between a global project, involving capital and diverse foreign interests, and an exclusively Chinese project would be substantive, especially for a small country such as my own. There is no doubt China has the economic resources and the ability to undertake massive infrastructure projects such as this canal through the heart of Nicaragua, but if this is a project whose viability depends entirely on the political will of the state of the PRC, the geopolitical, environmental, and institutional implications for our country become totally different. If the Chinese state is, in fact, behind the project and using Wang as a front, as the secretive tone of the responses to our reasonable questions seems to indicate, then we must be ready for that front to obey and serve China’s interests regardless of what that might mean for Nicaragua. This will require special measures to safeguard the national interests of Nicaragua, never mind those of other surrounding countries. The concessions for this new canal, granted in haste to HKND in a unilateral decision made by President Daniel Ortega, may compromise the sovereignty and national interests of the country in ways that could jeopardize our future for generations to come. In a country whose democratic institutions have already been gravely compromised by authoritarianism, the unlimited power exercised by Ortega in this project has produced a secret concessionary deal that essentially grants an enclave within our territory to a private company, which may well be a front for a foreign power. What is the implementation schedule and when will the feasibility studies including the technical, economic, and environmental impact of the canal be finished and disclosed? Will these studies, funded by HKND, be subject to the scrutiny of independent national and international experts? What will be the environmental impact of dredging Lake Nicaragua and how will its excavation and future dredging affect the country’s most important strategic water resources? Who will oversee our national interests given that the Ortega-created Grand Canal Authority has demonstrated little authority and no autonomy? My second concern relates to new twists that bend the rules of the game of the canal concession even before its construction starts. 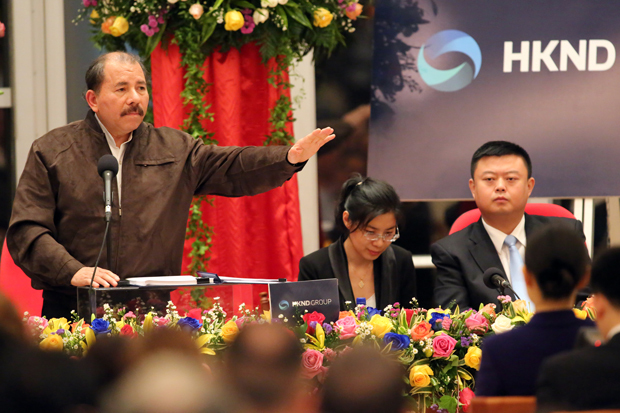 Under the absolute discretion granted by the Nicaraguan government to HKND, the company is proposing new business initiatives called “sub-projects of the canal” which will be independent from the actual construction of the canal. In the new design, the oil pipeline or railroad lines touted as part of the project when it was first announced have mysteriously disappeared. Instead, HKND revealed plans for a gigantic tourist project, the “San Lorenzo Vacation Resort,” to be located more than 10 kilometers south of Brito, i.e., a considerable distance from the canal route. There is no doubt, however, that attempting to carry on such tourist-centric business deals under the extraordinary powers bestowed by the canal law threatens to undermine property rights throughout the country. Legal experts pointed out the voracity of the Ortega-Wang agreement when the concession was first granted, but no one imagined the terms would be so extreme. During the COSEP-HKND conference I had the opportunity to ask the official spokesperson if the expropriation clause referred to in the canal law would also apply to the “tourist projects” and other business ventures. It was a timely opportunity for the Chinese company to clarify its intentions and its interpretation of a law custom-made for them. But that’s not the way it worked out. The response of Wang’s representative under the watchful eye of “the investment promoter” Laureano Ortega Murillo, the President’s son who serves as Wang’s official business liaison, was silence. It was a gesture that should serve as a clear alarm bell for both domestic and foreign investors. The opacity of the Chinese response regarding exactly what it is doing, and who is doing it, should also serve as a warning to other countries about the underlying interest of China in Latin America.